Our amazing paralegal team has an extensive amount of (over 50+ years combined) experience and has processed thousands of legal applications for our clients. Deborah L. Ward, Owner/Manager of the Canadian Legal Resource Centre Inc., has worked in the paralegal industry since 1987 assisting over 10,000 clients with Canadian Pardons (now called Record Suspensions), United States Waiver of Inadmissibility applications, Uncontested Divorces, Legal Separation Agreements and Fingerprinting. She has a degree in business (B.Comm. ), two paralegal diplomas, an Immigration Practitioner Diploma, and continues to take continuing education courses in a variety of areas including family law and mediation. Debbie is also a Commissioner for Oaths as well as an Accredited and Certified RCMP Fingerprint Agent. 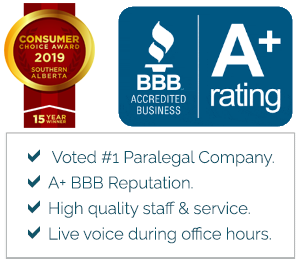 As evidence of her commitment to excellence, the Canadian Legal Resource Centre Inc. has won the Consumers Choice Awards 14 years in a row (2006 to 2019), has an A+ Reputation with the Better Business Bureau, and is one of the largest paralegal companies in Canada. On a personal level, Debbie has competed in Powerlifting (she broke a world record and all of the Canadian Records for her weight class) and has won two bodybuilding competitions. Debbie is a drug-free athlete. Her past hobbies include singing in a choir (14 years), participating as a member of Toastmasters International (7 years), and volunteering with Special Olympics (Assistant Powerlifting Coach). Susan has worked in the paralegal industry at the Canadian Legal Resource Centre Inc. since January 2009. She works primarily in the divorce & fingerprinting area. She also provides support to the Pardons & Waivers department. Previously, she worked in retail and continues to provide support to her husband on a part-time basis in residential renovations. The greatest asset she brings to Canadian Legal Resource Centre Inc. is her consistent & focused dedication to getting the job done as quickly as possible while maintaining high-quality standards and excellent rapport with clients. Susan has completed a paralegal course in divorces and two courses towards a mediation certificate program. She is a Commissioner for Oaths and Accredited and Certified Fingerprint Agent. Sue is the proud mother of 2 sons and ‘gramma’ of 5 boys and 3 girls. She shares the same last name as Deborah Ward, President and Owner of CLRC because she is married to Deborah’s very lucky brother and has been a part of Deborah’s family since 1989. In her spare time, Susan enjoys the hot sun, reading novels, spending time with her grandchildren and camping (while her husband cooks on the barbeque). Jacqueline has been employed as a paralegal with the Canadian Legal Resource Centre Inc. since October 2008, where she has gained in-depth knowledge on applications involving criminal records, including Applications for United States Waivers of Inadmissibility and Record Suspensions (previously called Pardons). She also has 2 years working experience in the same field with a previous employer. In addition, fingerprinting is an essential part of the business which Jacqueline partakes in on a daily basis. Jacqueline has fingerprinted hundreds of people for matters related to Pardons, Waivers, Immigration, Licensing, Employment, and Volunteering. She is an accredited and certified fingerprint agent. Jacqueline graduated from Humber College in Toronto with a Diploma in Law Clerk and Court & Tribunal Agent, and then furthered her education with a diploma in Business Professional. She is also a graduate of the Dale Carnegie’s Sales Effectiveness Course and continues to demonstrate her commitment to providing excellent client services through continuous learning. Currently, Jacqueline is studying to become a licensed immigration consultant. spending time outdoors among the trees or near the water. What’s most important to Jacqueline is her relationship with God, family, and friends. Ella has been with the Canadian Legal Resource Centre Inc. since October 1, 2013. She works in the Pardons/Waiver department and also assists with fingerprinting. Ella has recently graduated with Honours from the Professional Legal Assistant program. Previously, she pursued a Bachelor of Arts degree with a major in Law and Society and a minor in Chinese. As well, she is able to speak and write in Tagalog and Mandarin, and has won the Chinese Speech Contest in her final year at the University of Calgary. Ella has worked for almost 12 years in customer service and understands the need for efficient and friendly service. Having worked with people from various backgrounds, she is adept at being a team-player. Ella is passionate about volunteering. She has worked with both local and international organizations such as the Elizabeth Fry Society, Pinoy Without Borders, and World Vision. She loves working with youths and is part of the Youth Ministry at her local church. When she’s not working or volunteering, Ella enjoys various extra-curricular activities. She loves reading novels and has a big collection of books. She is also an avid writer and film editor, and has a blog where she writes and creates fan-made videos. Most of all, Ella loves travelling and tasting foods from different parts of the world and has enjoyed foods from China, Indonesia, and Singapore. Starting September 2016, Ella is going from a full-time to a part-time position with the Canadian Legal Resource Centre Inc., so that she may pursue full-time Pastoral Studies (Master of Divinity). Candy completed her Paralegal Diploma with honors in 2012. She accepted a practicum position with Canadian Legal Resource Centre Inc. in 2013 where she was offered a full-time position with the paralegal team. Originally, Candy started out at the reception desk while gaining valuable experience in fingerprinting, US Waivers, Record Suspensions, and a little bit of Divorce. She has now moved exclusively into the Pardon and Waiver department where she brings to her position 15 prior years of customer service experience working in a variety of industries including retail (liquor store sales associate, floral designer and convenience store clerk) and government (Clerk with the Crown Prosecutor’s Office). Her most challenging position, however, was working as a domestic engineer raising 2 children (one with special needs). Candy is the proud mother of two beautiful daughters and Gramma aka “Gee Gee” to two wonderful grandchildren. She spends much of her spare time with her grandchildren. She also loves NASCAR, enjoys walking, movies, music, and reading. She also loves working normal working hours that do not involve shift work and late night hours! In March 2015, Wendy became a member of the CLRC team after relocating to Alberta from Ontario. In Ontario, she worked at a resort as Conference Service Manager for 12 years. Coming from the hospitality industry, Wendy is a hardworking and dedicated team member who loves working with people and providing the best possible customer service. She is involved in an array of responsibilities and duties offering support to Debbie and the whole team. Her responsibilities include bookkeeping, sales and marketing, operations specialist, and divorce paralegal. Operations specialist is a fancy way of saying she works on automation that helps our staff be more productive and efficient (thus being more responsive to the needs of our clients), and auto-responders that automatically keep our clients up-to-date. Wendy is the proud mother of a daughter and two sons as well as Grammy to 3 granddaughters and 2 grandsons. Wendy enjoys activities that include golfing, long walks with her husband Ed and her dog, reading, painting, and being surrounded by family and friends. Chrissie is the lifeline of our office. She has been with us since September 2017. She is our receptionist. She ensures all clients walk in and out with a big smile on their face. She is very friendly to everyone and often gets many compliments from clients for being so approachable. She’s also a certified esthetician who used to have a salon and has over 15-years experience in customer service. Being the first face our clients see, Chrissie represents our office in many ways. Her charm and easy-going nature are what makes many of our clients keep coming back. Originally from New Brunswick, her French is pretty good! Chrissie’s favorite hobbies are being a soccer mom to 2 beautiful boys, watching funny movies and photography. You can often find her a reading a book too, she’s a big bookworm! Vini is an RCMP Accredited and Certified Fingerprint Agent. He has been with us since April 2018. 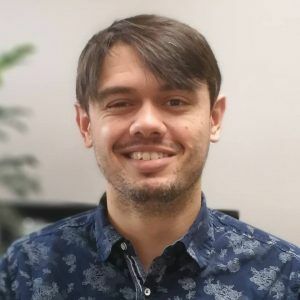 In addition to ink and digital fingerprinting, he also digitizes fingerprints from other countries for processing in Canada, completes 48-hour name checks and helps with social media marketing. He brings to the position 7-years experience in the hospitality and customer service industry. Coming from a hospitality background, Vini has many skills in the service industry. He is patient with all clients and ensures all appointments go as smoothly as possible. Vini has a Bachelor of Communications (Journalism) and contributed to The Calgary Journal and Mount Royal’s independent newspaper The Reflector for a combined total of 2 years 9 months.Vini is proficient in both Portuguese and Spanish languages due to being born in Brazil and knows more French than he lets on. Of course, being raised most of his life in Calgary his English is pretty good too! He is also one our youngest workers in the office! Outside work, Vini enjoys going to the gym and playing the occasional game of Pokémon.